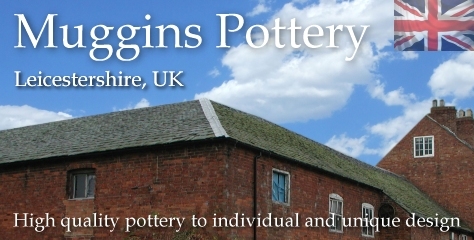 Pottery Vases | hand-made pottery from Muggins Pottery in Leicestershire - wedding gifts, birthday presents, christening presents and anniversary gifts. A simple Muggins wall vase. Each is completely unique. Hang it somewhere in the garden, fill it with water and display your favourite cut flowers. The vase has a flat back which allows it to hang stably against most surfaces - a small hole in the top rear makes it easy to hang on a nail. Avoid leaving it out where there is a risk of frost. Prone to loneliness, so please buy in groups. A bearded Muggins wall vase. Each is completely unique. Hang it somewhere in the garden, fill it with water and display your favourite cut flowers. The vase has a flat back which allows it to hang stably against most surfaces - a small hole in the top rear makes it easy to hang on a nail. Avoid leaving it out where there is a risk of frost. Prone to loneliness, so please buy in groups. A wormy Muggins wall vase. Each is completely unique. Hang it somewhere in the garden, fill it with water and display your favourite cut flowers. The vase has a flat back which allows it to hang stably against most surfaces - a small hole in the top rear makes it easy to hang on a nail. Avoid leaving it out where there is a risk of frost. Prone to loneliness, so please buy in groups. The elephant arrived today. Thank you for your prompt response. I am very impressed with the figure. I reckon my Wife will want the herd!